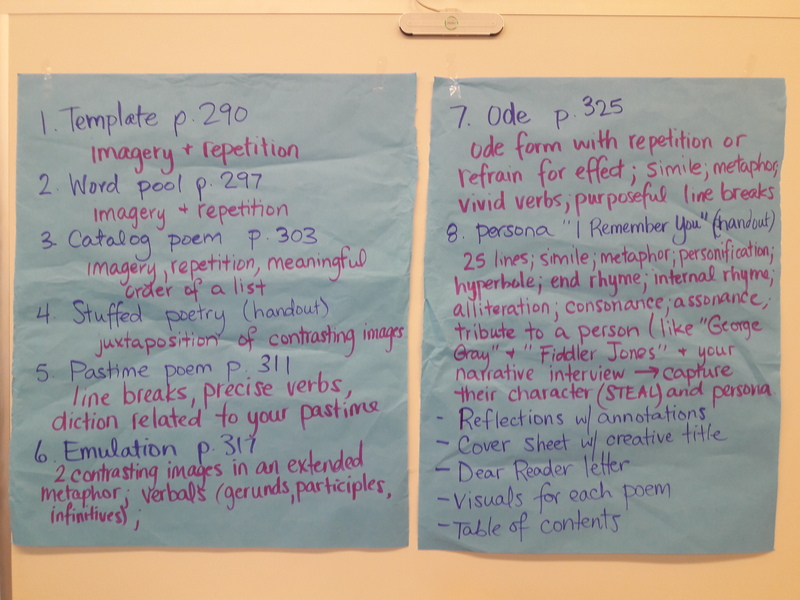 T 10/3 – Turn in TPFASST for BOTH Poetry Out Loud poems; include a copy of each poem with annotations. Recite ONE of your poems in class. Th 10/5 – Finish No Red Ink quiz for verbals, parallelism, embedded quotations, and active/passive voice. F 10/6 – Read through Part I of The Night Circus; use the Night Circus Study Guide Part I to prepare for the in class reading quiz; finish ZINC for this quarter. M 10/9 – Complete SAT Reading & Writing Domain Tests on USA Test Prep. Opener: Review exposition of The Night Circus; examine study guide and remind students of the reading quiz for Part I on Friday. Introduce The Tempest: View images Visual Texts and Shakespeare’s Language; Word/Phrase Bank and write poems/prose passages to share. 2. 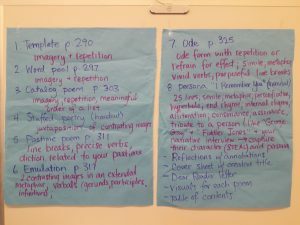 Discuss themes that emerge from the images and poems and create a list for the unit study of The Tempest. Closer: Rehearse Poetry Out Loud performances in small groups. Homework: Finish TPFASST and annotations for BOTH Poetry Out Loud poems; prepare to recite ONE poem in class. Opener: Quick rehearsal for POL; turn in TPCASST and annotations for both poems. Closer: Review study guide for The Night Circus Part I. Homework: Read The Night Circus Part I, using the study guide to prepare for the reading quiz. Work Session: Set up Nearpod. Opener: Quick review of The Night Circus Part I study guide. Complete Q2 touchstone and SRI. Complete No Red Ink quiz. Work on USA Test Prep for PSAT and ZINC for Q2 snapshot. Closer: Continue reading The Night Circus. Homework: Read The Night Circus Part I, using the study guide to prepare for the reading quiz; finish No Red Ink quiz. Opener: The Night Circus Part I reading quiz. Review Part I (characters, setting, sequence of events, conflicts–exposition elements). Analyze Chandresh, Tsukiko, and Bailey (Lit. Analysis Part I). Closer: Read The Night Circus Part II, focusing on parallel plots. Homework: Finish ZINC for Q2; work on USA Test Prep assignments due Oct. 9; read The Night Circus Part II, focusing on parallel plots. Th 10/5–Bring props/materials for Othello 2.3 performances. F 10/6–Group meetings for EPCOT projects/research novels. Leaders should provide agendas; reading coaches should provide reading questions. Opener: Review Othello 1.1, 1.2, 1.3 (film adaptation and/or scene summaries). Discuss character objectives, superobjectives, and beat changes. Review Iago’s and Roderigo’s changing motivations. View the scene, comparing & contrasting script to film. Closer: Read 2.1, focusing on the setting change and Iago’s asides. Opener: Finish reading 2.1 and 2.2 (Herald’s scene); review setting change from Venice to Cyprus. Perform subtext scenarios (Fred); discuss importance of adding cues for subtext (blocking, movement on stage, physical gestures,voice inflection, emphasis, props). Read 2.3.1-40; use stage directions promptbook to model adding cues for subtext. Assign 2.3 Drinking Scene to three groups; annotate scripts to add cues for subtext; plan props, costumes, stage scenery/backdrops for classroom productions. Closer: Continue working on 2.3 analysis. Opener: Continue working on 2.3 analysis. Rehearse drinking scene to prepare for tomorrow’s production. Closer: List items needed for tomorrow’s production. *Homework: Bring props/materials for tomorrow’s production of Othello 2.3. Read EPCOT/research novels and prepare for group meetings Friday. Learning Goal(s): Cite strong and thorough textual evidence to support analysis, including uncertainties; analyze the impact of the author’s choices regarding how to develop and relate elements of a story and how to structure specific parts of a text. Opener: Quick rehearsal for Othello 2.3. Closer: Share agendas/reading questions for tomorrow’s meetings; begin thinking about potential research topics. Opener: List potential research topics on a notecard; prepare to discuss with groups. 5th EPCOT novel group meeting (45 minutes) discuss questions established by the reading coach cast member, set action items for next week’s meeting. Prepare TWIST and multiple choice questions for passages from research novels. Please enjoy your time off with family and friends! If you have the time and means, you should continue reading your EPCOT project novel and communicate with your group members to plan and complete the required elements of the project. Remember your purpose and audience: develop an engaging, interactive experience that brings a social, scientific, or cultural issue to life for an international audience of families who might visit EPCOT. You will also have an individual research component, so begin thinking about thematic topics the author of your novel addresses. How do those topics tie in to current social issues, ethical concerns, or cultural beliefs? If you have the time and the means, it is always a good idea to work ahead of due dates, so I am including the ZINC, No Red Ink, USA Test Prep Checklist for you to plan your time. You should also consider reading Part I of The Night Circus to be prepared for the first reading quiz. Here is a Night Circus Study Guide Part I to help you focus. M 9/18 – Obtain a copy of The Night Circus; bring to class Thurs. T 10/3 – Poetry Out Loud annotations & TPFASST due for both poems; recitation due for one poem. Opener: Peer review poetry anthology (students should have at least 6 poems with reflections by now), offering feedback and suggestions. Opener: Turn in poetry anthologies. Revisit Poetry Out Loud choices; continue annotating and completing TPFASST charts. Practice reading POL poem with a partner; mark words to emphasis, places to pause, etc. to prepare to memorize and recite. Introduce The Night Circus reading schedule. Read article about 19th century circuses. Closer: Read the opening chapter of The Night Circus and analyze the exposition (setting, characters, conflict) and structure of the novel. Opener: Gallery walk pictures for inspiration and choose one. View images Visual Texts and Shakespeare’s Language; Word/Phrase Bank and write poems/prose passages to share: View the images, selecting one that inspires you; Study the picture and construct a hypothetical narrative based on the elements you see; Using a list of Shakespearean terms and phrases, choose lines that relate to the picture and your hypothetical narrative; Without adding ANY words (articles, prepositions, etc.) students must juxtapose phrases and words to tell the story of their painting. Closer: Continue reading Part I of The Night Circus. F 9/21–Group meetings for EPCOT projects/research novels. Leaders should provide agendas; reading coaches should provide reading questions. Opener: Post theme statements on posters to create webs of texts we have studied. Complete TWIST graphic for Othello 1.1, opening conversation between Roderigo and Iago. Why do Iago, Roderigo, and Brabantio hate the man they are discussing? What reasons does Iago give for continuing to follow his master? What kind of person do you expect the man they discuss to be? How do you imagine him? Count the number of times the word Moor is used in 1.1. Can you draw any conclusions? Closer: Compare/contrast film adaptations of the opening scene of Othello. Opener: Creative Writing–examine the painting McSorley’s Bar (or Nighthawks) and compose a short scene using STEAL to build a character. Rehearse and perform group scenes 1.2. Discuss the following: We saw Othello for the first time in this scene—is he what you thought he would be? Is he respected by his associates? How do you know? What contrasts are there between the way Iago, Roderigo, and Brabantio have described Othello and the way he looks and behaves when he actually appears? Do you notice basic differences in attitude between Cassio and Iago in their short conversation (1.2.60-65) following Othello’s exit? Why is Brabantio convinced that Othello must have used witchcraft on his daughter? Why does he have difficulty believing his daughter could run to Othello’s “sooty bosom’? Read 1.3 antiphonally; compare/contrast Iago’s characterization of Othello in 1.1 with Othello’s representation of himself and the council’s reactions to him in 1.3 (complete STEAL with textual evidence for both scenes). Closer: View 1.2 – 1.3. Opener: Review elements of rhetorical triangle, ethos, logos, and pathos. View 1.3 from various film adaptations. Discuss character objectives and beat changes in dramatic productions. Read 2.1, 2.2 (Herald’s scene); paraphrase to ensure comprehension. Complete a Somebody Wanted But So for what we have read of Othello: What are Iago’s motivations? What are Roderigo’s desires? What are Othello’s desires? How does each man react/adapt in order to achieve his objective? Closer: Locate a passage for a TWIST style analysis of your research novel. Opener: Review FRQ tips for 9s: worldly observation to start, strong claims, circular intros/conclusions, working chronologically through a piece of text to analyze, strong verbs & few modifiers. FRQ: compose an essay to answer an AP free response question. Complete MCM on a Thursday. Closer: In small groups (2-3) write Attack the Question This Way strategies for the MC questions. Opener: Complete a TWIST with your selected passage from your research novel. 4th EPCOT novel group meeting (45 minutes) discuss questions established by the reading coach cast member, set action items for next week’s meeting. Closer: Make plans for continued work over the break or a plan to handle group needs with people who may be traveling/unavailable. W 9/13–POL presentations; TPCASST for both poems due in class; explication for the poem you recite is due to Turnitin.com before class. Opener: Turn in TPCASST and poetry explications. School is closed Monday and Tuesday due to the weather conditions from Hurricane Irma. Please be safe! Honors 9th Literature–work on Zinc and No Red Ink and enjoy some independent reading! You can also work on your poetry anthologies. Looking for inspiration? Try this Stuffed Poetry activity. AP Literature–finish your explications, due Wednesday before class. Memorize your POL poem and complete your TPFASST charts for both poems. Read your EPCOT/research novel. T 9/5 – Bring two poems printed from the Poetry Out Loud website. We will work with them through this unit, so choose wisely. Th 9/7 – IR project due for presentation; choose one from the menu Alternative Book Report. Opener: IAN–Revisit the poetry glossary and complete QHT for each word; fill in the next set of definitions, textual examples, and original examples. Check POL poems; mark hard stops and words you don’t know. Model marking nouns and verbs with “Constantly Risking Absurdity”; mark in POL poems, looking for categories of meaning. Write a free verse poem/focus on imagery and repetition. Closer: Examine “Dear Reader” letter and sample reflections for poetry anthology. Compose reflections for your template poem (last week, p.290) and your free verse poem (written today). Opener: IAN–Activity 4.4 (SB) Brainstorm childhood memories. SB: Read the catalog poem “Nikki-Rosa”; answer text dependent questions. Complete “Working from the Text” on an index card; exchange and respond, then discuss. Examine “Every Ghetto, Every City“ by Lauryn Hill and “I Hear America Singing” by Walt Whitman as examples; write a catalog poem (focusing on imagery, repetition, order of the catalog). Closer: Reflect on your catalog poem. Opener: Present IR projects; IAN: Create a list of books you’d like to read based on student presentations. Closer: Polish reflections for the three poems you have written. Compose reflections for the poems you have completed so far. Closer: IR–Enjoy! and/or continue composing poems and reflecting on your writing.